The Dvash-Banksfamily: (from L to R) Elad, Aiden, Ethan, and Andrew. Aiden and Ethan Dvash-Banks were born four minutes apart. The twins, now 16 months old, love chasing each other around the house, wear the same clothes and share an obsession with Elmo. In the eyes of the US government, however, the boys are not equal. Aiden is a citizen – and Ethan is undocumented. 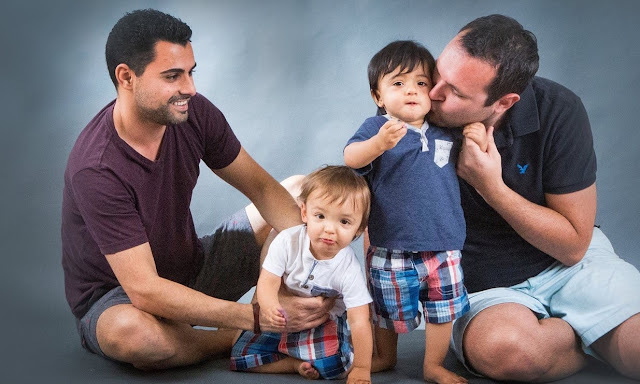 The boys’ parents are a married gay couple, and even though they legally share the same two fathers, the government has ruled only one is eligible to be a citizen. In a new federal lawsuit, the Los Angeles family is challenging a policy that they say discriminates against LGBT people by denying birthright citizenship to the children of gay couples based on blood relationships. The fathers, a US citizen and an Israeli citizen, are both listed on the birth certificates of the twins and legally are the exclusive parents of the boys, who shared a surrogate. But because Ethan has the DNA of the Israeli father and Aiden has the DNA of the US father, the government has denied Ethan.